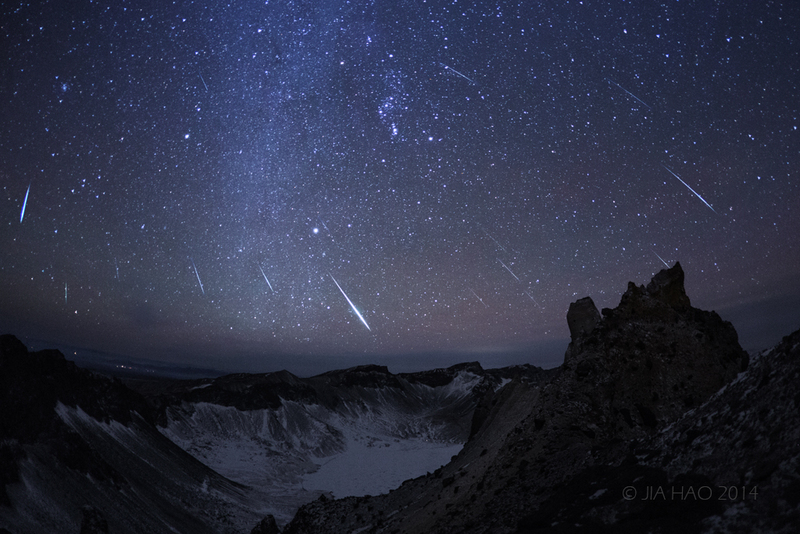 Explanation: Known in the north as a winter meteor shower, the 2014 Geminids rain down on this rugged, frozen landscape. The scene was recorded from the summit of Mt. Changbai along China's northeastern border with North Korea as a composite of digital frames capturing bright meteors near the shower's peak. Orion is near picture centre above the volcanic cater lake. The shower's radiant in the constellation Gemini is to the upper left, at the apparent orgin of all the meteor streaks. Paying the price for such a dreamlike view of the celestial spectacle, photographer Jia Hao reports severe wind gusts and wintery minus 34 degree C temperatures near the summit.